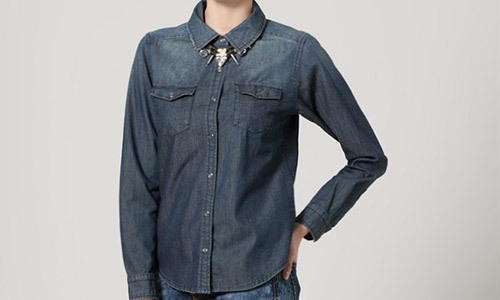 Freshen up your favourite casual looks with contemporary denim shirts. Engineered shapes hug your curves, whilst loose boyfriend styles are perfect for covering up on long summer nights. Breathe new life into retro double denim trends with structured denim shirts layered over black skinny jeans, playing with a balance of contrasting tones and textures. Opt for a country inspired look with a tailored denim shirt layered over a floral print boho dress, teaming with ballerinas and oversized sunglasses to add a touch of definition. If you're looking for a more polished look, layer a lightweight denim shirt underneath a structured blazer and sartorial women's shorts, ideal for taking to the office. Indigo blue denim shirts are perfect for layering up at the weekend, best worn open over skinny fit leggings, a plain white t-shirt and pure black trainers. Structured denim fabrics provide a contemporary to the classic denim jacket, perfect for wearing with colourful jeans for a youthful dressed down look. Use yours to push the boundaries of smart casual, interspersing with a lace women's vest tops, statement necklace and high heeled shoes to wear on an evening in the city. A must-have for any wardrobe, denim dresses by themselves or teamed with t-shirts are great for a playful summer look. 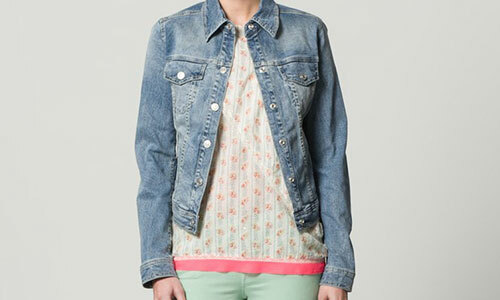 Denim jackets are the ideal go-to piece for in between seasons. They are usually short in length and are easily combinable, both in light or darker denim washes. The various washes and finishes mentioned in this guide are not only for trousers, but for denim skirts too. Pick your favourite styles from the range shown below. Amazingly versatile, the denim shirt can be used as a cover up on warm summer nights or buttoned up for a more smart casual look. An 80s classic that lives on today.